Harsh completed his Schooling from St Marys School, Mumbai followed by Graduation & Post Graduation in Hindi from Kishinchand Chellaram College, Mumbai University. Since College days he was more into College Festivals and cultural functions as his priority was to learn how to handle team and get work done while organizing events. 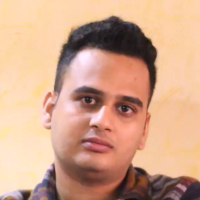 He started his career as an Intern in Movie called Mans World after that he has done couple of movies such as Boy in Bollywood - Assistant Director to Mr Farha Jaan Sheikh , Happy Bhag Jayegi - Directors Assistant to Mr Mudasar Aziz, Jia aur Jia - Assistant to Mr Howard Rosemeyer and Love per square foot Assistant to Mr Anand Tiwari . A film director is a person who directs the making of a film. Generally, a film director controls a film's artistic and dramatic aspects and visualizes the screenplay (or script) while guiding the technical crew and actors in the fulfillment of that vision. "I have completed my schooling from St Mary's School, Mumbai followed by Graduation & Post Graduation in Hindi from Kishinchand Chellaram College, Mumbai University. I have done movies such as Happy Bhag Jayegi, Jia aur Jia as a part of Direction team."